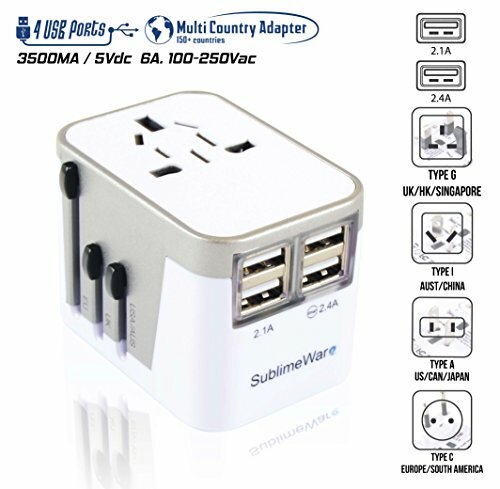 [THE PERFECT WORLDWIDE TRAVEL ADAPTOR] - Use this Universal Power Adaptor to 150+ countries, fits with US UK EU CHINA outlets. This all in one travel adaptor comes in one piece, and where many USB Travel Adapter comes in many pieces. [SIMULTAINEOUS DEVICE CHARGING 4 DEVICES] - This is the only Travel Adapter you will need! Dual USB is not enough these days, you need a power travel adapter that will charge two phones, a tablet and camera when you go travel. Get the 4 Port USB Power Travel Adapter today and save the headache. Compatible with: iPhone 7/7 Plus, 6/6S, 6/6S Plus, 5/5S, iPad Air/Mini; Samsung Galaxy S7, S6, S5, Note, Tab; HTC; Nexus; Bluetooth Speaker Headset; Powerbank and USB Powered Devices. [4 PORT USB INTERNATIONAL PLUG FOR TRAVEL] - Multi USB Port Hub with 4 Smart USB Ports 2×2.4A/2×2.1A, at 3500mA. Charge up to four devices at the same time, which the ports automatically adapting the output for each one accordingly. ✔Strong "Lock in" mechanism to keep the plugin pins. Most cheap travel adapters have flimsy pins that won't stay in place.